If you are tailgating or out RV camping, then you want to expand your outdoor space by including a pop-up tent. But not all EZ pop-up tents are created equal. 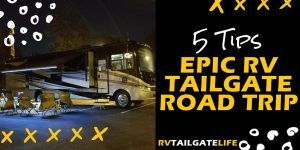 Let’s take a look at the best tailgate tent! I have recommended various pop-up tents before. They are usually of the officially licensed varieties. But when it’s raining outside, you need a heavy duty RV tailgating tent. Not just any EZ Pop-up tent will do. Mere mortal pop-up tents are liable to break, twist, and fail just when you need them the most. 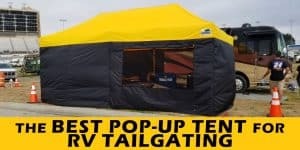 After a season of football tailgating and the 2019 Atlanta NASCAR tailgate with these new tents and years of tailgating with inferior products, I can definitely recommend the Eurmax Pop-up tent as the absolute best RV tailgating pop-up tent. Now, I specifically mention the 2019 Atlanta NASCAR tailgate because for three days, it rained. And it was cold. And well, not the best tailgating situation because of the rain and cold. But we made the best of it with the Eurmax Professional Pop-up Instant Canopy Tents. The Eurmax Canopies are not the cheapest pop-up tents. But this is definitely one of those situation where you get what you pay for. They are pricey. But they are definitely worth every cent. First, the canopies are a thick, heavy duty material that holds up a lot better to the elements than your average pop-up tent. The seams are sealed, not just sewn, to keep water out. The canopies also have steel rings that you can use to attach ropes or tie down straps for extra security during windy tailgates. There are also built in velcro tie-downs to keep the canopy to the pop-up frame. They may not have your favorite team logo on the top, but the canopies come in a variety of colors – white, black, blue, red, brown, purple, green gold, orange, green, etc. You can find one that will fit with your team tailgate colors. The canopy blocks 95% of UVA and UVB rays, to help protect you from the dangers of the suns’ rays. 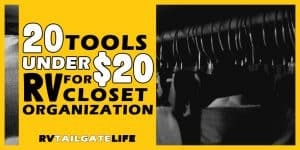 This is absolutely awesome way to stay cool during those hot tailgates during baseball season and early football season. Second, let’s talk the frame itself. The bars are heavy duty and hexagon shape. This makes them much stronger than most of the other pop-up tents on the market. It seems like every season, someone is leaving behind a lesser quality pop-up tent because they bent, cracked, or just destroyed the frame on their pop-up tent. You won’t be seeing that with the Eurmax tents. Third, the storage bag. Yes, this is a selling feature. When you are buying a Eurmax Canopy, especially the large 10×20 canopy, all this awesomeness is heavy. It’s going to take up more storage space and more importantly, it’s going to be hard to drag to your setup spot. You want wheels! And this storage bag has wheels to make it easier to get the Eurmax pop-up tent into and out of your RV storage bays and to the setup spot. During football season, my tailgate crew had two Eurmax canopies, one in black and one in yellow. Each were 10×20, providing a great tailgate area with shade from the hot sun and coverage from the rain. But when it came time for the NASCAR race, with the forecast of cold, wet, and windy, it was time to add some accessories. That means walls. And weights. And side bars. The sidewalls, including the solid sidewalls, the window, and the door, were awesome additions during the cold, wet rain of NASCAR tailgating. They are easy to attach, with velcro across the top and zipper to attach to each other. There were also additional velcro straps to wrap around the canopy frame. Once it warmed up a bit, we could open the mesh window to get some air flow but still be protected from the rain and then the sun. The Eurmax sidewalls will typically fit any standard pop-up tent system. Just check your sizes (10 vs 8 feet). You can buy the pop-up tent, frame, storage bag, and sidewalls as a package deal on Amazon! This larger size is great for a larger covered area during the tailgate, but they do take up more storage space and are heavier. Buy The Eurmax 10×20 Tailgate Tent Package on Amazon! Similarly, you can get the 10×10 package, with the frame, canopy, sidewalls, and storage bag, in one deal as well. This is your more traditional tailgate pop-up tent size that will conveniently fit a table and some people. It’s smaller, both for storage and in weight. Buy The Eurmax 10×10 Tailgate Tent Package on Amazon! Here you can see the inside of the Eurmax pop-up tailgating tent, with the window panel rolled up. Look on the left side of the picture to see the frame – the velcro straps that secure the sidewalls to the frame as well as the side rail bar. Even with the window rolled up, there was minimal water coming in. However, when the wind got going, the window did have to be rolled down to keep the inside dry. When it’s windy outside, the entire Eurmax canopy system might need some additional reinforcement. Mostly to keep the sidewalls from blowing in and getting everyone wet. This is where the rail bars come in. They come in two packs, so you’ll need twopacks for the 10×20 but we have an extra since you won’t put one up on the door or window panels. At some point, we will have wind. It’s why we are so concerned about our RV awnings, other than the accumulation of rain. The wind can do a real number of tents and awnings. More importantly than the tent itself, you want to protect your RV from flying projectiles like tents that are picked up in the wind. Because when a pop-up tent hits an RV, scratches, dents, and even broken windows are often the result. If you are in a grassy field, you can use tie down stakes. But in parking lots, you are more limited. That’s where tent weights come in. Eurmax has two versions – sand filled tent weights and water filled tent weights. I personally prefer the sand filled weights. You can actually use a variety of materials, including sand or rock/gravel. The sand bags are also conveniently designed to stay securely attached to the pop-up tent legs and provides about 50-60 pounds of weight when full (depending on what material you use). Meanwhile, the water weights can be filled with water or even sand. But they are a more rigid plastic than the sand weights. Like the sand weights, they are designed to securely fit against the tent legs. But they don’t wrap around the legs like the sand bags do (hence why I prefer the sand bags). The biggest downside to the Eurmax tents, especially the larger 10×20 system, is that you need a small army to set them up. With the standard pop-up tent, you can usually get away with just two people to set them up. With the larger Eurmax tents, you’ll want at a minimum three people, strong and tall people. Really, you’ll want 4 to 6 people. Similarly, the additional weight and size will need to be accounted for in your RV storage. Can you fit the larger frame and accessories in your RV basement storage? The extra weight adds to the overall weight, limiting what else you can take with you (especially when you add the weight bags). You’ll need to watch how and where you store to make sure that you don’t over-burden one side of the RV to provide a weight imbalance. Eurmax has a 100% satisfaction guarantee for their products, along with a one year warranty. This should give you the piece of mind to order the more expensive tailgate tent. If you really aren’t happy with the tent, Eurmax will take care of you. Order the Eurmax 10×20 tailgate tent, along with the sidewalls, and be ready for your next rainy tailgate. Or just get the tent, without the sidewalls, to survive those really hot tailgates that happen for baseball and early football season.